Just a few words to introduce you to Thor Audio. This US-based Company officially started business in 1996, but three years were spent before then designing circuits, testing and choosing components, and designing (with the tubes in mind) their pretty unique toroid chassis's. The goal was to design and build something really unique, revolutionary and with no price limitations. The best of the best. So they started from scratch, so to say. The main idea was: form must follow function. Hence the toroid. What is a toroid? Take a look at the picture and you'll know what a toroid actually looks like in real life. Mathematically a torus is, roughly speaking, a surface obtained by rotating a vertical disk or a circle around (at a prescribed distance) a vertical axis. What you get is nothing else than a bicycle inner tube. If, instead of the disk, you rotate a rectangle, you get a Thor Audio chassis. Hence a toroid. Why? Because it has some pretty interesting mechanical, geometric and shielding properties. You may know that some of the better transformers are toroidal. You also know that tubes need much air surrounding them because of the heat they produce. Mounting them vertically is a very good idea with just one little drawback: the poor shielding from electromagnetic interferences. With the toroidal chassis the tubes are vertical, do have plenty of air surrounding them and are perfectly shielded (a metallic chromed top plate is available too). Then you may know that tubes, especially those used with line or phono stages are highly microphonic, i.e. they tend to resonate and act like a microphone. A toroid makes the vibrations concentrate in the center, where they can be easily dissipated. So the Thor Audio designers have placed three audio pin points under the chassis and a reasonable amount of damping material into the chassis. Now that the form was following function a clever choice of the components and circuit schemes was to be considered. All Thor Audio components are essentially hard-wired, with the PC board used for holding the components - not to connect them. Every component in the audio signal chain is either soldered tube pin to tube pin, or is hard wired. Also, individual shielding for each wire is fitted, installed, and shrink-wrapped. For these reasons each Thor Audio product comes with a five Year Warranty. Tubes life is expected to range from four to ten years. The TA-1000 is their first design: a no-nonsense tube preamp with a massive separated power supply, designed to compete with the best preamps in the market. When the huge package arrived at home I was suddenly impressed by the care for tiny details. Once opened the TA-1000 revealed all its charm and the superb quality of its finish. Pictures are never good enough in cases like this. Testing a price-no-object HiFi component is always an entertaining and challenging experience for any audio reviewer. The TA 1000 is an all-tube preamp but this is hard to believe while you're listening to it. 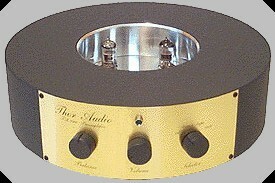 Don't get me wrong: a tube equipped component is expected to sound refined but even sometimes slow and warm. In other words, slightly and sweetly relaxed. Not so the TA 1000, it is extremely lively, punchy and "polished", like the best solid state preamps. Plus, it does have a touch of smooth velvet that makes its sound relaxing (yet not "relaxed") and amazingly entertaining. Precision is the keyword here: both the high, the mid and the bass range have a precision which is simply astounding. Each detail is extracted and then reproduced so naturally that the Music lives and pulses in front of you, far behind either your loudspeakers and your room walls. Take the bass range, for example: deep till the lowest end, tight, extremely punchy and full-bodied. No, not the tube-like smooth and sometimes out-of-control bass range of many other tube components. This is one of the best bass range I've ever heard. Double bass and lower organ pedals are not a problem for the TA 1000, it reproduces these difficult instruments always with plenty of energy and control. What about the mid range? Here its tube soul shines above the rest: female and male voices are plenty of pathos, clean and natural just like the singers were into the listening room. The breath of the singer, the sound of the lips opening to start singing and the overall sense of reality are sometimes thrilling, especially when listening at night with all the lights turned off. It seems like Sara K or Thelma Houston are right there, in front of you. Thanks to the extreme precision of the high range the acoustic string instruments are incredibly realistic, for example you can clearly detect the sound of the fingers picking the strings and the subsequent harmonic vibration of the wood. The TA 1000 is very coherent too: no steps or edges can be heard when it's playing, the different frequency ranges melt one into the other and there's nothing the TA 1000 prefers to play. It's just Music, at its best. It is a tube preamp but, again, it is hard to detect. The dynamic performance of the TA 1000 is simply walls shaking. Explosive, so much that it can easily reveal the limits of the other components in the system, power amp and loudspeakers. Fast and lively, the TA 1000 is plenty of punch. Can it play rock? You bet!!! Can it play massive orchestral works? You can count on it! This preamp can play virtally anything, offering to the listener the best of each recording. Can it sound smooth and delicate? Turn the volume down and the TA 1000 microdynamics will make the listening at low levels a whole new emotional experience. It is a tube preamp, after all. When needed, the tubes give that extra plus of smoothness and clarity. Oh well, this one is easy. With preamps like this the walls of your room disappear, exactly like your loudspeakers. Around you there's just Music, it is the air that vibrates, not the speakers. Other no-compromise preamps do that. There one thing that puts the TA 1000 into a league of its own: the precision and the focus of the image. When reading the brochure of the TA 1000 there was a phrase about pin-point imaging. I read this before, on other brochures, so I just thought...OK, another pin point imaging HiFi component. Oh, how wrong I was, my friends. If pin point imaging has a meaning, it should be referred to the ability of the TA 1000 to place each instrument into the soundstage with a micrometric precision. You don't need to force your imagination...well, the saxophone should be right there, uhm, let's see, maybe a little bit on the right....Nope! The saxophone IS there, sculpted into the soundstage and you can look at it from side to side. The organ is THERE too, where it should be, while the choir is slightly ahead...here the female voices and there the men. Amazing. Pin point imaging and focus at their best. Moreover -and quite surprisingly- you don't need a super-duper hi-zoot HiFi system to HEAR this effect. The TA 1000 is capable to create an incredibly realistic 3D image even with mid-priced systems, which means that imaging is destroyed (or created) by the quality of the preamp, mainly. The owner's manual suggests a long warm up before any serious listening. The funny thing is that during the warm up the height of the soundstage progressively increases. It is very low during the first minutes then it goes over the ceiling after a couple of hours. Warm up, warm up, warm up. Few other things are needed to enjoy this preamp at its best. Then a good power cord is necessary and, of course, good interconnects. The level of transparency of this unit is so high that it works as the best cable tester I know. Hook up any cable and you'll know how good (or bad) is it. Just let the TA 1000 tell you everything. It won't lie. Each tiny difference becomes HUGE when the TA 1000 is into your system. Not much to say here. Will you have something to complain about a Ferrari? I won't. This preamp is expensive. Ok, there are much more expensive preamps out there but 7,000 $ is still a good amount of money. For this amount of money I'd like to have a remote controlled volume and inputs control, for example. No, it does not have anything to see with the Sound but this feature is quickly becoming a must even for the most extreme audiophile-oriented components and there are ways to avoid any side-effect on the performance of the unit. Also, a system of mechanical insulation for the power supply unit should be considered too: Vibrapods, pin points or something similar. Finally I'm sure the umbilical cord that links the main unit to its power supply is of the best quality available but I think that a couple of ferrite rings could be useful here. The cord is pretty long and could work as an antenna. I've found that placing ferrite rings around this kind of umbilical cords does have some positive effect on the sound of the unit. I hope you know Thelma Houston's (well, written by B. Boshell, actually) song I've got the Music in me (see Sheffield Labs Records CD-2). That's the TA 1000. It has got the Music in it. That song says also They say that Life is a circle.......what a coincidence. The TA 1000 is a state of the art preamplifier, it is not for everyone but everyone should listen to such a beauty at least once in a lifetime, exactly like everyone should drive a Ferrari once. As usual, a HUGE thank you to Paul Marks, the man behind (should I say...around? :-) ) Thor Audio products for having sent us the TA 1000 for this listening test (European premiere).